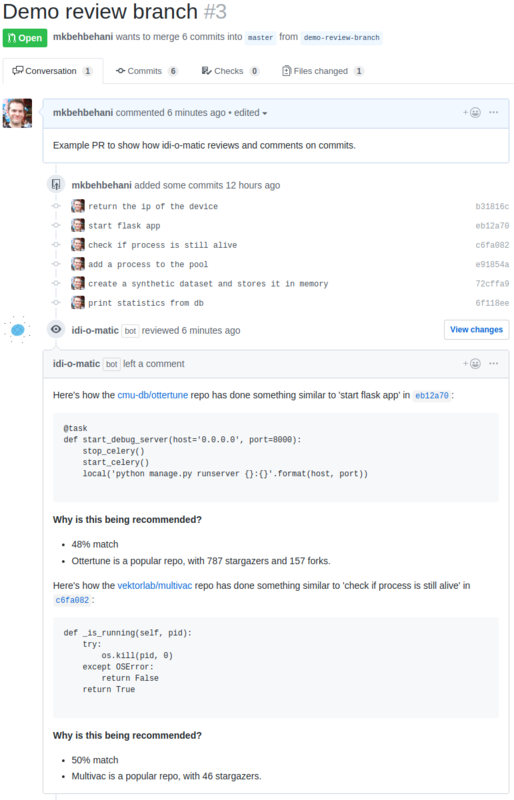 GitHub - mkbehbehani/idi-o-matic: Reviews your PR, provides examples of how popular repos did something similar. Reviews your PR, provides examples of how popular repos did something similar. Want to be notified of new releases in mkbehbehani/idi-o-matic? idi-o-matic reviews your PR and provides examples of how popular repos did something similar. When a PR is opened, idi-o-matic recieves a GitHub webhook payload and queries for the PR's commit messages. The experimental search results are filtered for match quality. idi-o-matic comments on the PR, suggesting relevant code along with the justification. Uses Octokit for GitHub API interaction. Used the GitHub GraphQL API and starter app for initial research. The GitHub Semantic Search suggests python repos, so this app is limited to python suggestions as well at the moment.